There's a new challenge at Justrite Stampers and that is to create a vintage Father's Day card. 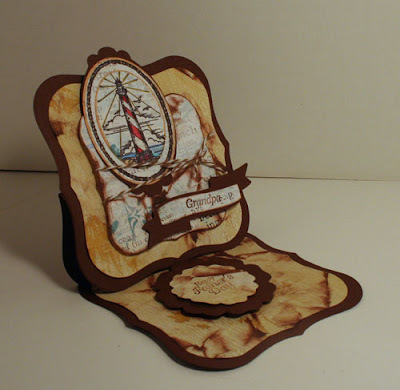 I used an oldie, but goodie stamp set - By the Sea. I stamped the lighthouse on some beach themed pattern paper with Clearsnap Ink, then colored the lighthouse with Smooch Ink. I cut out the lighthouse, then die cut the larger rope border. These were then mounted on another die cut for dimension. I created this easel shaped card using Spellbinders Grand Labels. The pattern paper was wet, crumpled and, when dry, inked to give it a more vintage/aged look. Before mounting my image, I added some twine around the smaller paper so that it would overlap the image. 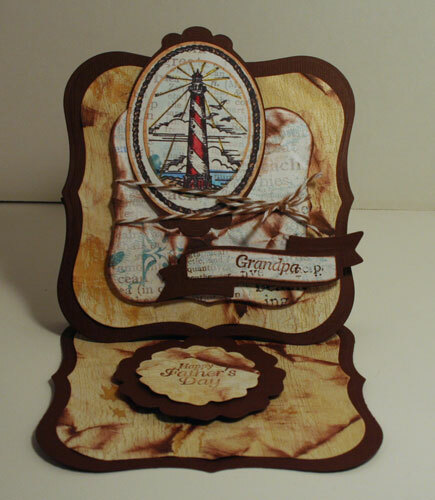 Grandpa was stamped on pattern paper using You are the Best Stamp set as was Happy Father's Day. Each was then die cut and added to the card. Very nice card! I really like everything about the card, but am most impressed with how nice your background came out. So far, I haven't made any background paper I'm happy with. Yours is beautiful! This a FABULOUS vintage male card, Steph, that any manly man would LOVE! I too like your BG paper -- nice job!! !